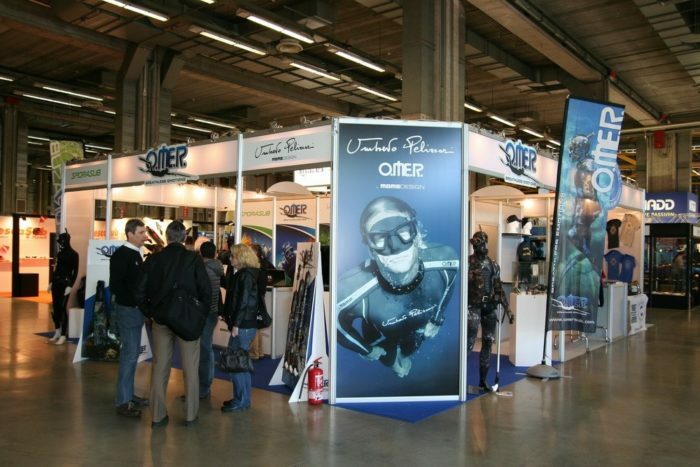 Many companies are present this year at what is the European show of spearfishing, freediving and scuba diving, the Eudi Show 2015 held in Bologna, Italy. Most of them are actually Italian, but often have an international presence and are known all around the world.  DeeperBlue.com was there already yesterday at the opening of the show for a good look around…. Giants of spearfishing such as Mares and Omer are present with nice stands. Mares actually has two separated areas for spearfishing (Mares Pure Instinct) and scuba diving. 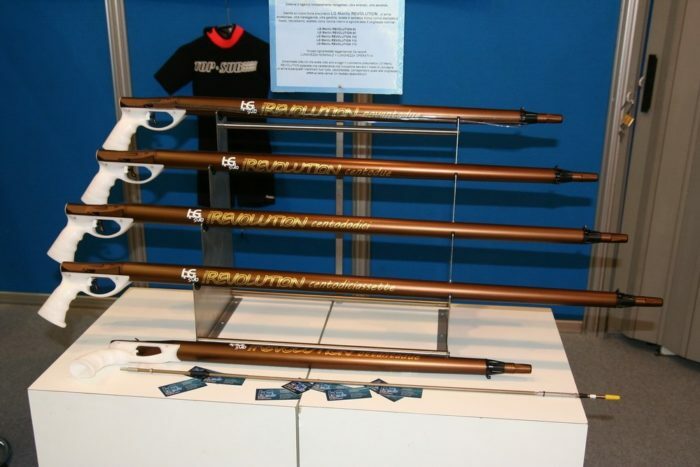 Some interesting news from Pure Instinct with the simple but extremely clever new grip of the pneumatic spearguns, such as the Viper Pro and the Cyrano Evo HF and the new mini knives in steel and titanium. 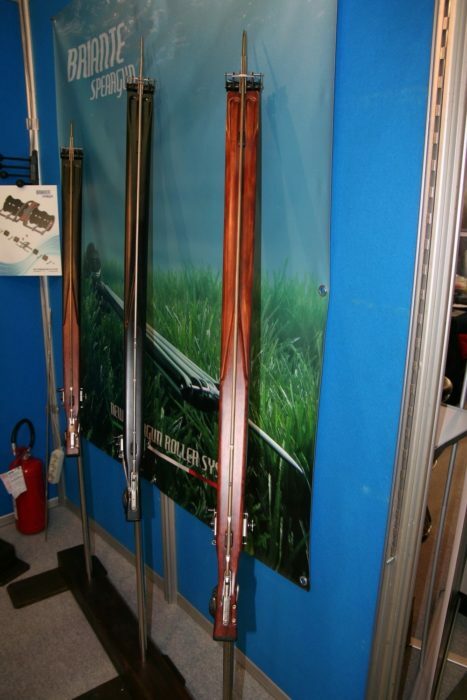 Real beauty is though present this year with the wooden guns, first of which the astonishing and well known Seawolf line. 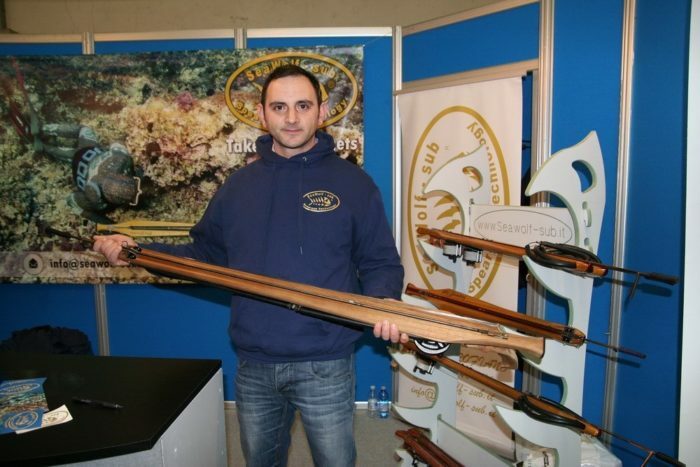 Starting from now as standard feature Seawolf spearguns will be completely made in Teak Burma Gold…not only Teak, but top quality selection! Details of construction are incredible, and precision goes beyond eyes capacity. We are talking about real cannons!!! A lot of innovation and very clear ideas come from the newly born company (you will only find them on facebook for now), Briante Design, with their fully patented gun and loads of new solutions, such as dismountable muzzle, elastic bands well hidden under the gun and a few other solutions we will go deeper into. Going on to less emotional, but extremely technological guns, there are quite a few pneumatic guns. Starting from the top of the line brand from Omer, Sporasub, with the Oneair, but also more craftsman companies such as LG Sub and Calibro 12. The latter seems to be the first time designer (some years ago) of a 12 mm internal barrel pneumatic gun, optimizing what were the weak points of such guns, weight and difficulty in loading. The Manilu Revolution from LG has its strength in the fact that the barrel nominal strength is almost the same as the operative length, thanks to the grip of the gun positioned incredibly backwards. Many companies also presenting their carbon fiber guns. 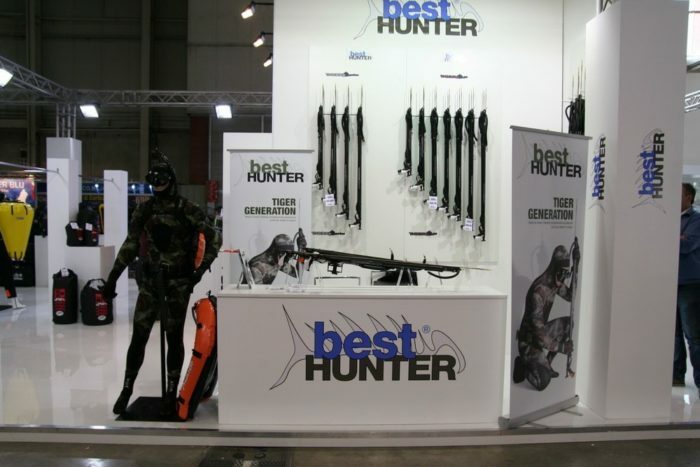 Best Hunter, known mainly for their buoys and mini dinghies for spearfishing, has presented its wetsuit and the spearguns line, with simple compact head, roller head and with aluminum and carbon fiber barrels. Massysub is present with the inverter gun, which permits to have incredible brandishing with the power of shot similar to a traditional a roller. 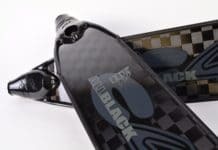 They also are present with the long version of their carbon fins, by the way specifically cut of any kind of foot pocket, so mounting and efficiency are always at top levels. But when you talk about carbon you know that the real leader company is C4. Both with guns and fins. The company has only a small area at the show…probably still concentrated on the new astonishing “Hypertech” carbon fiber fins. Another strong company in the carbon fiber sector is for sure CarbonioGFT. 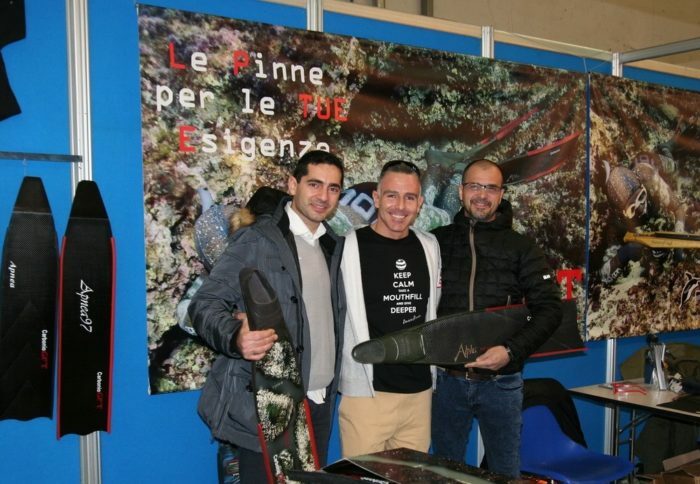 They have not been still looking at C4, and in fact have come out with the new Alpha fins, in World première at the Eudi show…deeper news to come! Also the beautiful Lady fins glass fiber line which is starting to be admired by the first female customers! 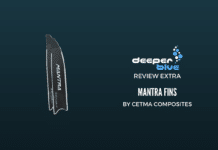 Cetma composites, just recently in the market of carbon fiber fins, is also working well, proposing a very good looking product, with very refined carbon fiber and lateral water rails. 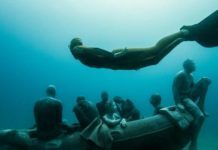 After the Edge model, Cetma is presenting the Prana solution, smaller, lighter than the Edge, it is aimed especially for surface swimming. All of this cannot work without a comfortable wetsuit. 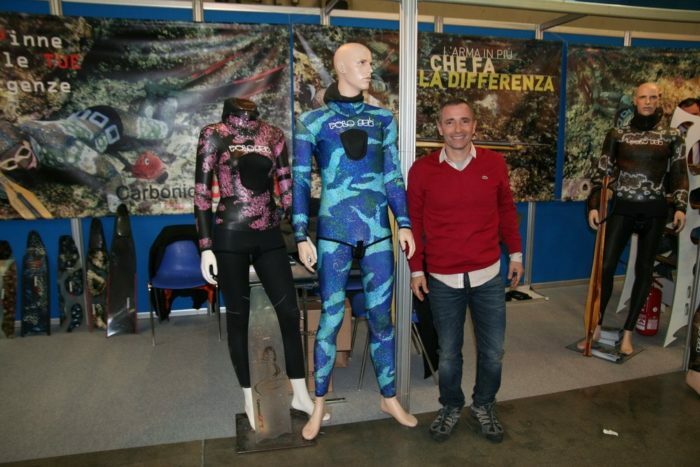 Polo Sub is present with its black/pink lady suit and the fantastic blue/dolphin mimetic man suit. The latter aimed for deep blue open water fishing. 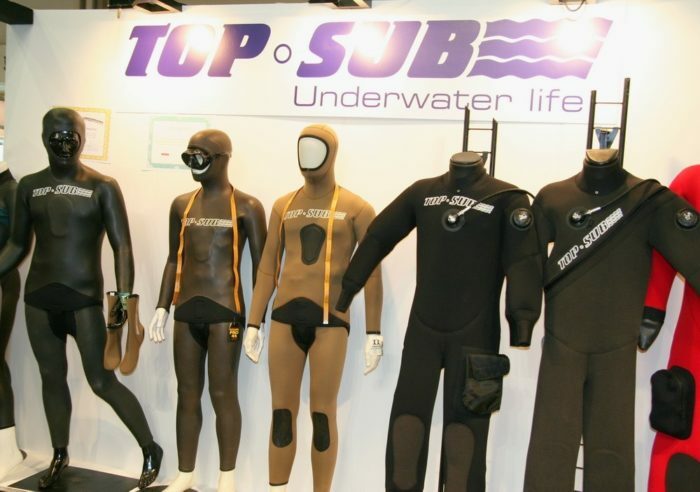 Top Sub is also present at the show, and the news is that all its suits now will be made of top quality neoprene, Yamamoto. In addition, a new bi-component glue is now used improving resistance and elasticity along time. If you are looking for best ever knives, well there is an Italian company who concentrates all its effort on such product: Mac Coltellerie. 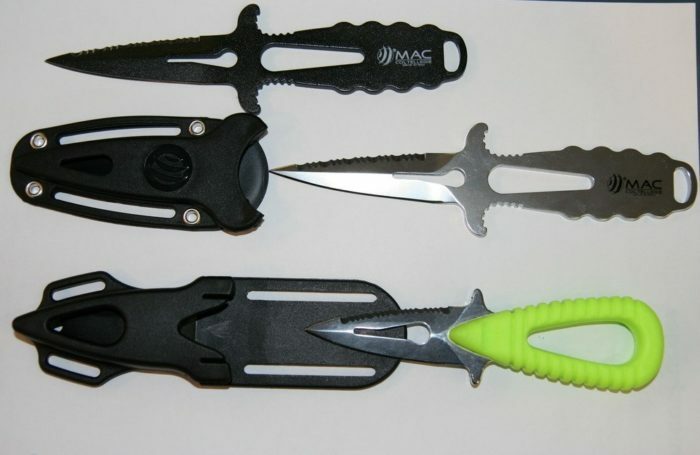 Incredibly beautiful and high quality compact knives, 100% steel, also covered with Teflon, and the new yellow handle mini knife. 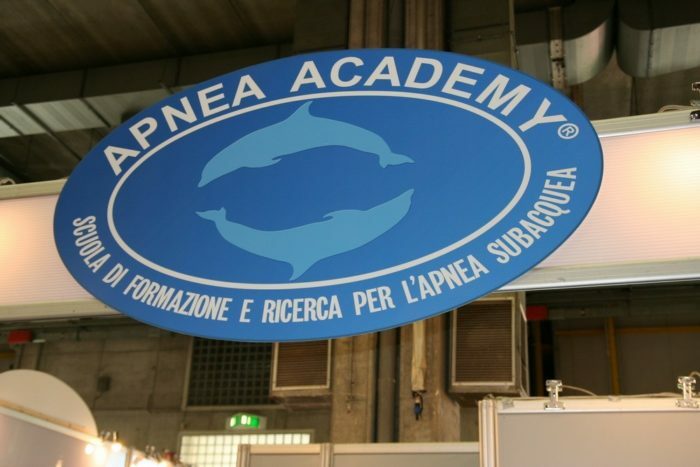 Finally, of course, Apnea Academy of Umberto Pellizzari is present to teach its students!